In the Western Sector of Canaima National Park , is the Auyantepui , one of the most famous tepuis . ( The flat mountains tepuis are those that end with immense vertical walls. ) 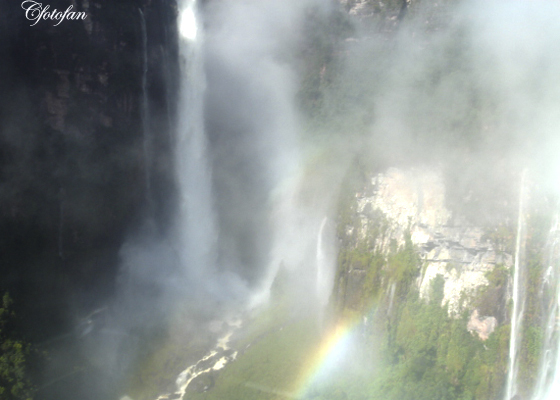 That tepui born Angel Falls with its 979 meters of free fall, the highest in the world. There are two ways to view the Angel Falls. One is from the air, by plane and the other is on a tour that leaves from the port Ucaima Canaima , and lasts more than 3 hours surfing the Carrao River and then the Churún . From Churún river to the viewpoint of Angel , you should walk about an hour through the jungle. The name of Angel is in honor of its discoverer : AngelEl Jimmy Angel has that name , in honor of the man who discovered it in 1937, the American adventurer and aviator Jimmy Angel . However, the indigenous people of the area, the Pemon , knew previously and had named it as Churún Merú. En el sector Occidental del parque nacional Canaima, está el Auyantepuy, uno de los tepuyes más conocidos. (Los tepuyes son esas montañas planas que terminan con inmensas paredes verticales.) De ese tepuy nace el Salto Angel, con sus 979 metros de caída libre, el más alto del mundo. Hay dos formas de ver el Salto Angel. Una de ellas es desde el aire, en avioneta y la otra es en una excursión que parte desde el puerto Ucaima en Canaima, y que dura más de 3 horas navegando por el río Carrao y luego por el Churún. Desde el río Churún, hasta el mirador del Salto Angel, se debe caminar aproximadamente una hora a través de la selva. El nombre del Salto Ángel es en honor a su descubridor: Jimmy AngelEl Salto Angel tiene ese nombre, en honor al hombre que lo descubrió en 1937, el aventurero y aviador norteamericano Jimmy Angel. Sin embargo, los indígenas de la zona, los Pemones, ya lo conocían anteriormente y lo habían bautizado como Churún Merú. This entry was posted in captures, culture, fotografías, fotos, gallery, historia, history, Images, imágenes, naturaleza, nature, photos, pictures, travel and tourism, turismo and tagged Angel, Angel Falls, angel waterfall, auyantepuy, Canaima National Park, cataratas, Jimmy Angel, Parque Nacional Canaima, salto Ángel, Venezuela. Bookmark the permalink.